He landed himself in hot water following last year's post-Olympics partying. 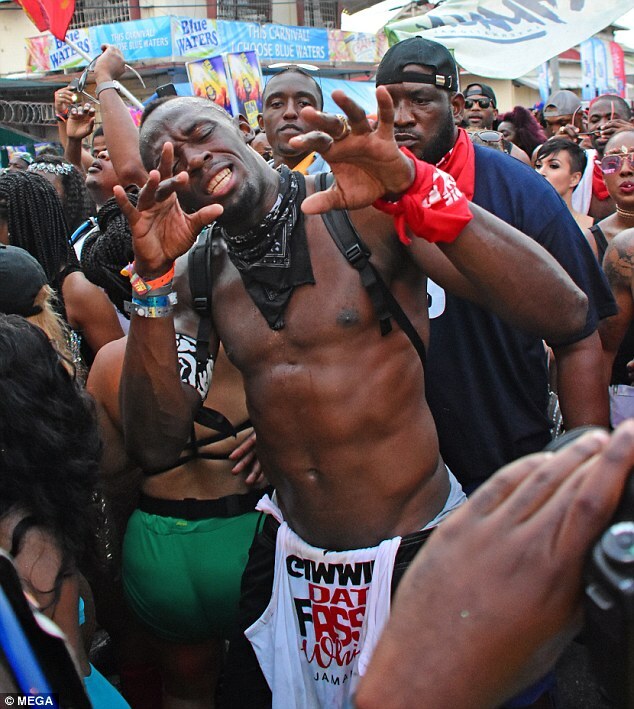 But Usain Bolt didn't let that stop him having a whale of a time at the Trinidad carnival over the weekend. 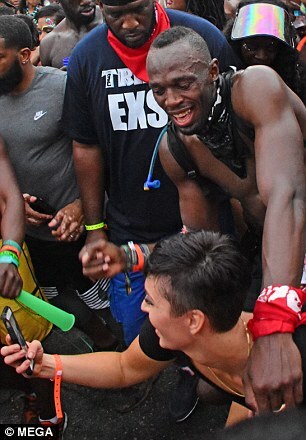 The fastest man in the world, 30, was seen grinding on a party of pretty women as they partied up the storm. 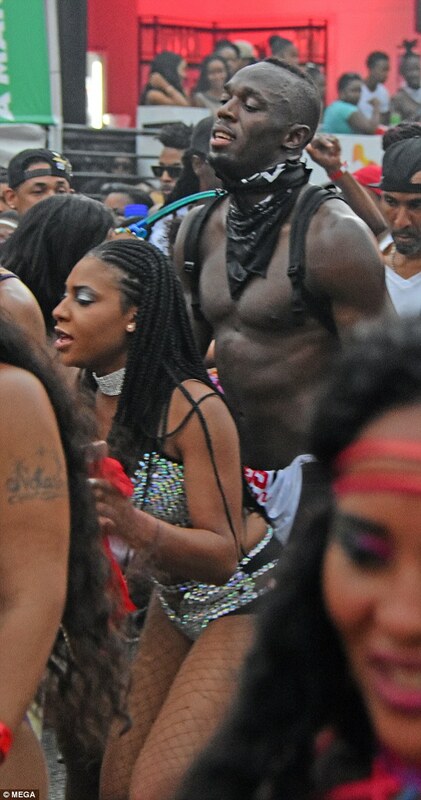 Throwing his shirt off in the Caribbean heat, Usain looked to be having a wild time at the yearly festival. 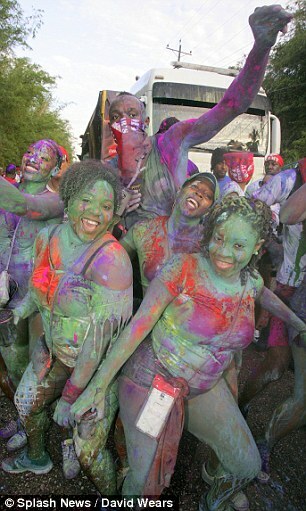 With a host of semi-clad beauties shaking their booties late into the night, Usain was spoilt for choice. Getting particularly racy with one bikini-clad party-goer, he was seen picking her up as she wrapped her legs around the statuesque star and they continued to grind in unison. And making the most of the raucous celebrations, he soon moved onto another influx of scantily-clad ladies. 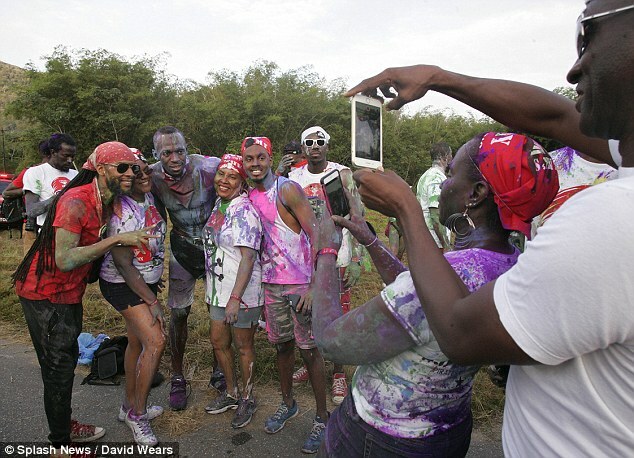 Bolt made headlines for his post-Rio partying antics last August, when he was spotted enjoying a series of nights out with a host of beautiful women. Photographs emerged on social media which appeared to show him spending the night with 20-year-old student Jady Duarte following his 30th birthday celebrations. The record-breaking sprinter - who has a long-term girlfriend - was also spotted kissing two other mystery brunettes while on nights out after the Olympics. 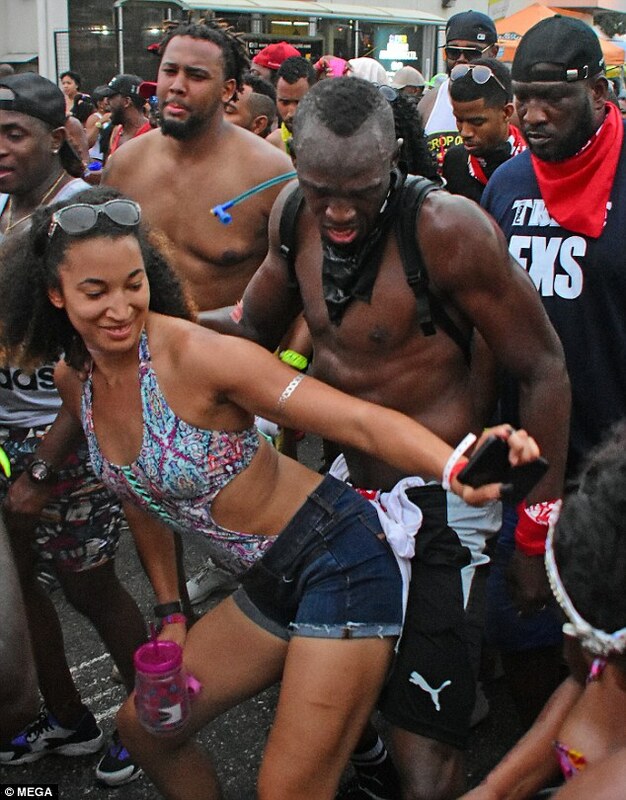 Bolt has been dating 26-year-old Kasi Bennett since 2014, and remained with him throughout the rumours. At the time she liked an Instagram meme which read, 'When your girl is Selfridges and you cheat with Primark', but maintained a dignified silence otherwise. However the superstar athlete’s sister Christine, 32, defended his actions and revealed the duo will stay together despite everything that’s happened. ‘I’m sure Kasi will be used to it by now. She is used to seeing pictures like this. ‘Usain doesn’t believe in cheating,’ she added. Bolt previously revealed in his documentary I Am Bolt that he is looking forward to starting a family. Last week Usain was crowned Laureus Sportsman of the Year for a record equaling fourth time, matching the achievement of Roger Federer and Serena Williams. 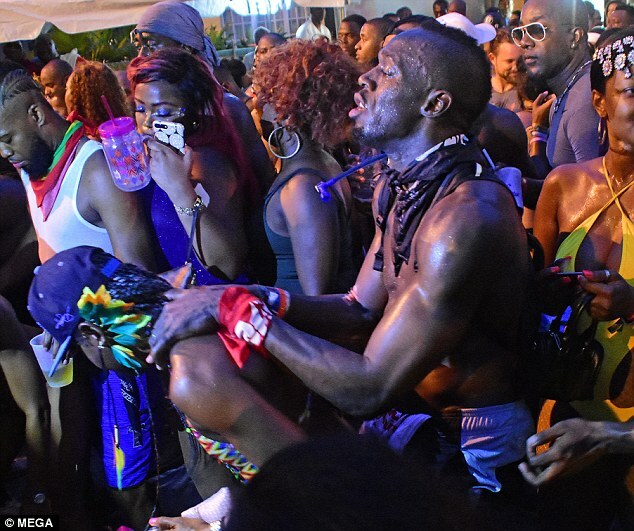 Usain Bolt is known for his love of a good party - and he didn't disappoint once again as he showed off his dance moves at a carnival in Trinidad. 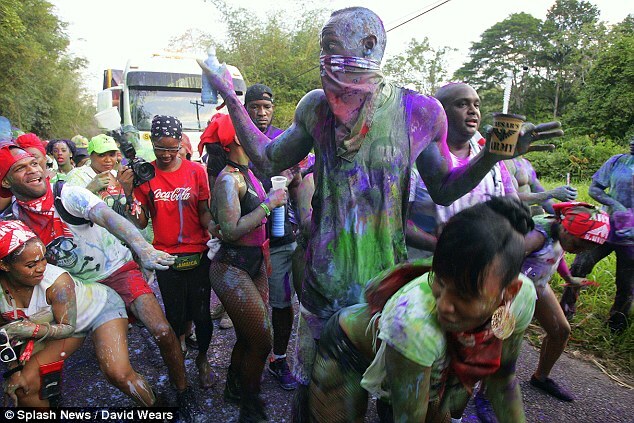 The eight-time Olympic gold medallist was covered in brightly-coloured paint as he twerked with other carnival-goers in Macqueripe on Saturday. 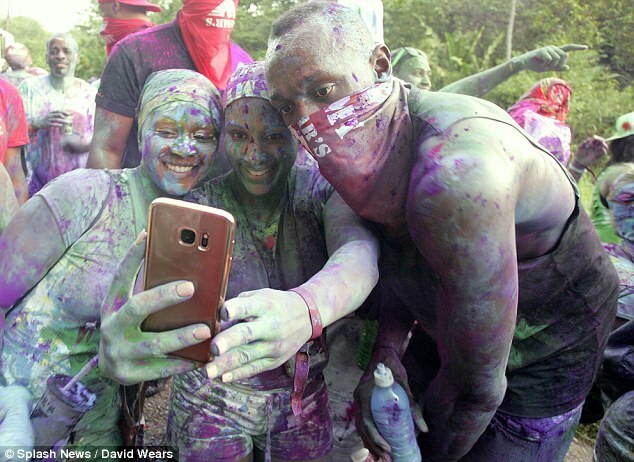 The 30-year-old sprinter squirted paint from a bottle onto fellow revellers and posed for selfies with fans during the morning celebrations. Even though he wore a scarf over his face at the Caesar's Army AM Bush party, the superstar was instantly recognisable as he showed off his signature moves. 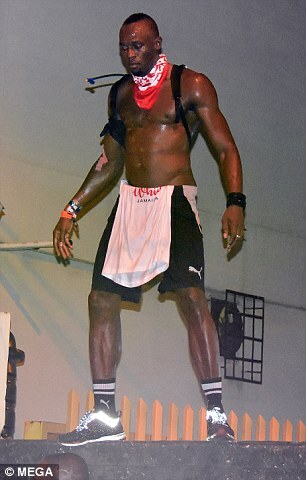 Bolt made the headlines for his post-Rio partying antics last August, when he was spotted enjoying a series of nights out with a host of beautiful women. Photographs posted on Snapchat appeared to show him spending the night with a 20-year-old student in Rio. 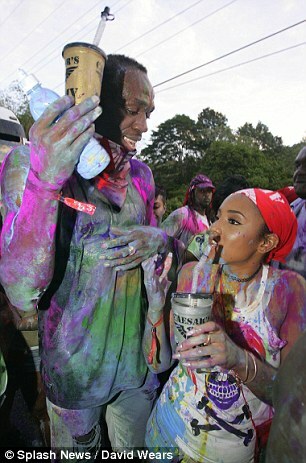 The pictures apparently showed Jady Duarte kissing and cuddling Bolt following his 30th birthday celebrations. The sprinter - who has a long-time girlfriend - was also spotted kissing two other mystery brunettes while on nights out after the Olympics. Bolt has been dating 26-year-old Kasi Bennett since 2014. In an Instagram post, the athlete dubbed himself 'the President' and Bennett his 'First Lady'. 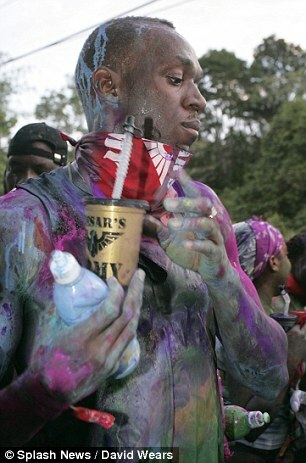 Bolt revealed in his documentary I Am Bolt that he is looking forward to starting a family. He is set to hang up his spikes following the World Championships in London this year. don't he have a girlfriend?